The Europe Organic Fertilizer Market was valued at $2,451 million in 2016, and is projected to reach $3,260 million by 2023, registering a CAGR of 4.2% from 2017 to 2023. Organic fertilizers are derived from organic compounds such as animal and vegetable waste. These fertilizers are a rich source of primary nutrients, which include nitrogen, phosphorus, and potassium and help maintain the health of the crops. Furthermore, they increase the organic & humus content in the soil, provide nutrients for microorganisms in the soil, and restore the physical&dash;chemical properties of the soil. Large-scale use of synthetic fertilizers has reduced the fertility of the soil in the European region. Thus, the adoption of organic fertilizers has increased considerably to restore the fertility of the soil. Government support coupled with increase in awareness toward the use of organic fertilizers drive the growth of the Europe organic fertilizers market. Moreover, the implementation of stringent regulations on the use of synthetic fertilizers boost the growth of the market. Also, harmful effects due to prolonged exposure to chemical fertilizer augments the growth of organic fertilizer market. However, the ongoing R&D activities of synthetic fertilizers and low nutrient content of organic fertilizers as compared to synthetic fertilizers hamper the growth of the market. On the contrary, increase in demand for organic food offers potential growth opportunity for the market expansion. The report segments the Europe organic fertilizer market based on source, crop type, form, and country. Based on source, the market is divided into plant, animal, and mineral. The animal segment is further bifurcated into manure and others. By crop type, it is categorized into cereal & grain, oilseed & pulse, fruit & vegetable, and others. Depending on form, it is bifurcated into dry and liquid. Country wise, it is analyzed across Germany, France, UK, Italy, Spain, and rest of Europe. The animal-based source for organic fertilizer was the highest revenue contributor, accounting for approximately 50% share in 2016, because animal-based organic fertilizers serve as an ideal source of nitrogen content, and provide other vital nutrients, required by the crops. Moreover, these fertilizers increase the water holding capacity of the soil. The manure segment accounted for approximately 65% of the animal-based organic fertilizer market. 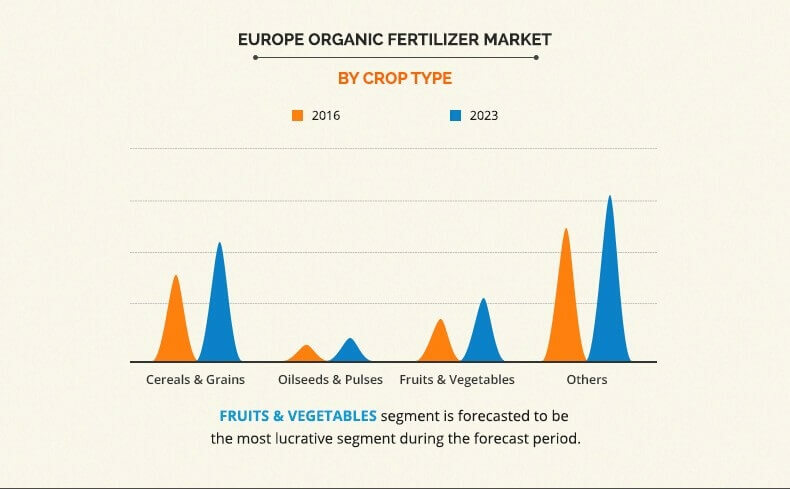 Spain is estimated to be the most lucrative market for the Europe organic fertilizer industry during the forecast period, owing to increase in awareness toward the benefits of organic fertilizers over inorganic fertilizers. Moreover, rise in number of organic farms in most of the regions of the country is anticipated to augment the adoption of organic fertilizers. In addition, upsurge in demand for organic products from other central and northern European countries is anticipated to provide lucrative opportunities for the manufacturers operating in the market. According to the forecast by Eurostat, Germany is estimated to be the third largest populated nation in EU member state by 2080, resulting in increased demand for food production. At present, Germany faces concerns regarding the need to develop agricultural practices that do not have adverse effects on the atmosphere and that result in increased food productivity. 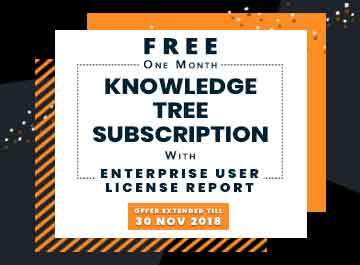 The prominent players profiled in this report include ILSA S.P.A, Italpollina SPA, Fertikal N.V., Uniflor Poland Ltd, Protan AG, Plantin SARL, Novozymes A/S., AGRIBIOS ITALIANA S.r.l., Viano, and E.B.F. EURO BIO FERT S.r.l. The report provides an in-depth analysis of the current trends, drivers, and dynamics of the Europe organic fertilizer market to elucidate the prevailing opportunities and tap the investment pockets. In-depth analysis of the key segments demonstrates the market potential of the Europe organic fertilizer industry. The Europe organic fertilizer market possesses a substantial scope for growth in the future, owing to increase in awareness toward the benefits of organic farming over conventional farming. Moreover, stringent regulations implemented by the governing bodies on the usage of inorganic fertilizers support the market growth in the region. However, lower nutrient content of organic fertilizers as compared to inorganic fertilizers is a major limitation to the market growth. Spain is projected to register significant growth as compared to Germany and other Europe, owing to augmented demand for organic products in the country. The Europe organic fertilizer market possesses a substantial scope for growth in the future, due to the increased awareness regarding the benefits of organic fertilizers. Harmful effects of inorganic fertilizer due to its prolonged use on environment further supplement the market growth. However, the low nutrient contents of organic fertilizer, as compared to inorganic fertilizer majorly restricts the market growth.